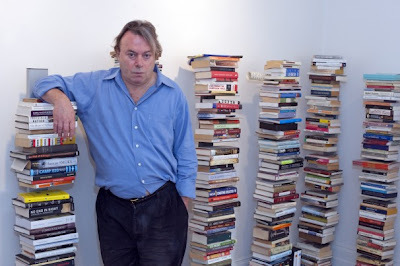 I am pretty certain that the books shown in this photo represent only a small number of the books reviewed by the person standing among them, Christopher Hitchens. Hitchens was a British-American author and journalist. He died in December 2011, at age sixty-two. Hitchens' obituary, printed in the Washington Post, characterized him as a "sharp-witted provocateur who used his formidable learning, biting wit and muscular prose style to skewer what he considered high-placed hypocrites, craven lackeys of the right and left, “Islamic fascists” and religious faith of any kind." The Washington Post description is on target, based on my recent reading of Arguably, a collection of Hitchens' essays ranging from an examination of American history to the legacy of totalitarianism and word play. I am grateful to my former colleague Fred Keeley for lending me the book. I recommend it to others (which is not to say that I agree with all of Hitchens' rants and raves). Hitchens' learning is "formidable," as the Post says. I, for instance, had never heard of Ketman, which means "the art and science of dissimulation, particularly in matters of religion." In other words, when religious orthodoxy prevails in a society, dissenters who don't hanker for martyrdom use Ketman to deceive the powers that be, appearing to fit within the norm, while actually making clear to the more intelligent how much they despise the orthodoxy and those who demand it. Luckily, the use of Ketman is not yet necessary in the United States (at least not much). Let's hope this doesn't become a word we all need to know.